Down to the Finals Thursday at the USTA Florida Bobby Curtis Jr. Tennis Chps. Each division is down to the final round for Thursday play at the 2012 USTA Florida Bobby Curtis Junior State Championships, held at the Florida Tennis Center in Daytona Beach for the boys’ and girls’ 18-14 divisions, and at Sanlando Park in Altamonte Springs for the 12-10 divisions. The Boys’ 18 final will feature the lowest-seeded meeting of any final in recent years at the Bobby Curtis Junior State Championships, as unseeded Bradenton resident and Florida State University rising sophomore Dominic Cotrone will meet No. 15 seed Grayson Goldin, another Bradenton resident. On Wednesday Cotrone rolled over Weston’s Joshua Goodman 6-2, 6-0 in the quarterfinals, then upset No. 16 seed Jose Gracia of Delray Beach 7-5, 6-4 in the semifinals. Goldin had a much more difficult road, upsetting No. 4 seed Sebastian Beltrame of Windermere 7-6(7), 6-2 in the quarterfinals, then producing another upset when he topped No. 6 seed Blaine Willenborg of Miami Shores 6-3, 6-2 in the semis. The Boys' 16 final is another surprise featuring two lower seeds -- No. 7 Alfredo Perez of Coral Gables, and No. 11 Mirko Radosevic of Miami. Radosevic upset No. 2 Javier Restrepo of Miami in the semifinals, and Perez upended No. 3 Terrance Whitehurst of Tallahassee, both in straight sets. The Boys’ 14 final will feature the Top 2 seeds, No. 1 Kaden Funk of Windermere, and No. 2 Gabriel Pilones of Bradenton. Both players cruised in straight sets in semifinal matches after both weathering three-set wins in the quarterfinals earlier in the day on Wednesday. In semifinals play in the Boys' 12 division in Altamonte Springs, No. 7 seed Robert Hammond from Boca Raton gained the final after a 6-3, 6-3 upset win over No. 4 Robert Slutsky of Weston, and No. 3 Mason Beiler of Palm Harbor advanced after stopping the run of unseeded Jacob Baehr of Pensacola 6-3, 6-4. The seedings held in the Girls’ 18 semifinals, where No. 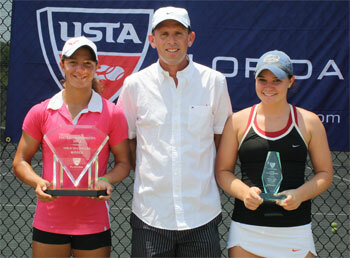 3 seed Katerina Stewart of Miami defeated No. 7 Kristin Wiley of Fort Lauderdale 7-6, 6-0, and No. 2 Maci Epstein of Windermere ended the run of unseeded Mia Horvit of Parkland 7-5, 6-1. Stewart will be attempting to make it two titles in a row at the Bobby Curtis Junior State Championships after last year winning the Girls’ 16 title. Also playing two rounds Wednesday to make up for rain was the Girls’ 16 division, where the seedings held to determine a showdown between No. 1 Bennett Dunn of Plantation and No. 2 Julia O’Loughlin of Lighthouse Point in the final. Neither player dropped a set as Dunn dispatched of No. 7 Star Makarome of Wesley Chapel and No. 10 Rachel Rohrabacher of Tampa in the quarters and semis, and O’Loughlin defeated No. 8 Alexandra Bourguignon of Boynton Beach, and unseeded Remi Ramos of Parkland. The Girls' 14 draw also proceeded through two rounds to make up for rain, where No. 1 Adriana Reami of Miami, and surprise No. 8 seed Jaeda Daniel of Wesley Chapel reached the final. Daniel upset No. 3 Anna Bright of Boca Raton in a marathon 6-7(11), 6-3, 7-5 comeback in the semifinals after earlier in the day defeating No. 11 seed Sofia Sewing of Doral 6-2, 6-1. Reami did not drop a set on Wednesday in dispatching of No. 5 Kariann Pierre-Louis of Miami, and No. 4 Maria Ross of Lakewood Ranch. Daniel will also be going for two titles in a row at the Florida Junior State Championships after last year claiming the title in the Girls’ 12 division. In semifinals play in the Girls' 12 division in Altamonte Springs, Bradenton’s unseeded Whitney Osuigwe was a surprise finalist after upsetting No. 2 seed Alana Wolfberg of Orlando 7-6(4), 6-1. In the final she will meet No. 3 seed Sophia Edwards of Sarasota, who defeated No. 7 Melissa Sakar of Lauderdale Lakes 7-5, 6-3. Boys' 18 – final 9 a.m. Boy's 16 – final 9 a.m. Boys' 14 – final 11 a.m. Girls' 18 – final 11 a.m. Girls' 16 – final 9 a.m. Girls' 14 – final 9 a.m. The 64th USTA Florida Bobby Curtis Junior State Championships, the event that has showcased three future world No. 1 ranked players from the state of Florida, is being played June 9-14, 2012. The event sees the 18-14 age divisions played at the Florida Tennis Center in Daytona Beach, and the 12-10 divisions played at Sanlando Park in Altamonte Springs. Former world No. 1s Chris Evert, Andy Roddick and Jim Courier are among the players that have raised trophies of competed at the event that prior to 2012 was known as the USTA Florida Jr. State Closed Championship, renamed in 2012 to honor legendary Florida junior tennis organizer Bobby Curtis. The complete age 10 and 12 draws, results and seedings can be viewed at: http://tennislink.usta.com/TOURNAMENTS/TournamentHome_New/Tournament.aspx?T=112735. The complete age 14, 16, and 18 draws and seedings can be viewed at: http://tennislink.usta.com/TOURNAMENTS/TournamentHome_New/Tournament.aspx?T=119656.